Summer is my favourite time of year. I love the style, and I love the weather. It's the best time of year for us style and fashion bloggers because the days are great for taking photos in the sunshine, and showing off all our best outfits. It seems like anything goes in summer too but this year I'm particularly loving two trends. I really love the 70's festival vibe going on with tile and Japanese prints, fringing and wide legs. And I also love the monochrome and navy trend with lovely black on white stripes. They are two very different trends, but I like having the choice of styling a smarter monochrome outfit with flashes of blue, or a having a more casual festival feel to a look. I also really like yellow and orange this year. But like bright yellow, and bright orange. I'm not the only one right? 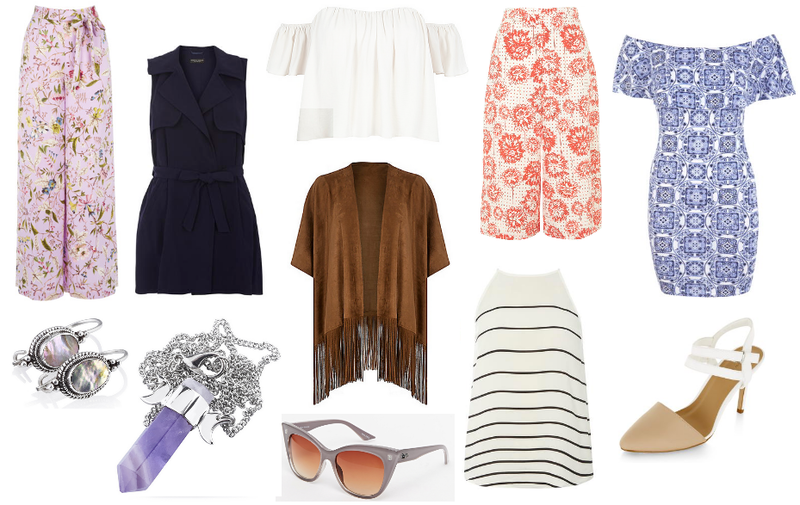 Everything looks so wonderfully floaty, oh I do love a good summer haul! That blue dress from Miss Selfridge was also on my recent wishlist, i love it! Also loving the jewellery and the kimono! It's such a pretty dress though isn't it?